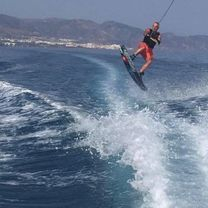 Our extensive range of watersports equipment includes wakeboards, waterskis, ringos, screamers and wake surf boards. With every activity option we provide tuition and guidance for those that need it - ensuring you all get the most out of the activities. If some of your group aren't sure about the wakeboarding or waterskiing then no problem - there is plenty of enjoyment to be had from the boat - taking in the great views and your mates efforts! The ringos/screamers are one of our most popular options with the chance to get in the water together and hang on! We guarantee great laughs and memories - fancy dress optional!. Bring along your camera or video to capture those special moments then post them on our website for all to view.